I use the term, “Blink in my Blog,” for the weeks when I don’t post a blog entry. Since I started publishing last fall, there have been only two such gaps—the first due to a temporary illness that I wrote about the following week. You may have noticed another blink last week and wondered if I am sick again. No. I feel fine. I actually wrote two blog entries but decided against posting either. Watching my grandkids practice their batting prompted the first. I described a memory from when my own children played little league ball. After T-Ball, at about age seven, the boys graduated into hardball and the girls started to play softball. The coaching of the two genders was different. The names of the games pretty much sum up the contrast in approach. Reflecting on that sent me into a more distant memory of developing my identity as a female in the 50s. Social norms taught me to play down the “masculine” traits like logic and independence and play up the “feminine” ones like submission and nurturing. The journey towards honouring both sides of myself and getting them into balance has been a long one. I’m still in transit. This topic is too fresh and personal for a blog entry at the moment. On Thursday, I had an “aha” about something else that had happened during the week. I dashed off another potential entry. Eager to get it posted before the Friday deadline, I sent it to the two people mentioned to see if they were comfortable with it, and realized that the anecdote needed to remain confidential. There went that blog idea, too. 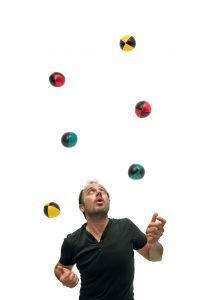 I think the universe is telling me I’ve got more balls in the air than I can juggle effectively. The attempt to publish a blog weekly is one of them. I need to set down it down for now, lest it turn into a hot potato. This entry was posted in Writing on May 25, 2017 by Wilda.